With so much of demand for good content materials these days, it could not have been too long before they were considered to be intellectual properties. That is to say that there are no surprises over the fact that some contents are the rightful properties or the legal belongings of their creator. According to blogging ethics or the principles of blogosphere, there are some legal blog copyright laws that bloggers can adhere to. These are not written set of rules and regulations but principles that would do a world of good to your creativity while also giving due respect to other’s. 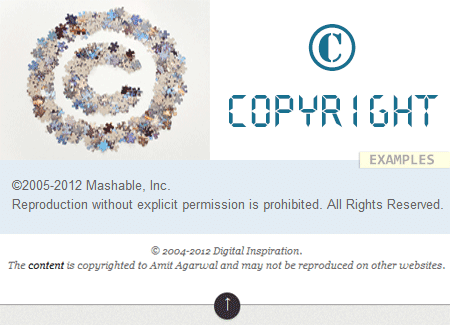 What is Blogging Copyright or Blog Copyright Laws ? Copyright protection is basically individual rights that protect an author’s ownership status. Most web contents including blogs are protected under the law of copyright. Copying the contents of a blog post and using them for other posts is as bad as copying contents from copyright printed books and using them for one’s own purpose. The moment a blog post is created with original contents and images, it is protected by blog copyright laws. Once you are done with a blog post and selected an image for it (not compulsory), the content becomes yours. Nobody else can copy or claim it. There is absolutely no need to register a work to prove its ownership. But sometimes bloggers use the copyright symbol (©) just to let people know that their contents are protected and not for copying. A common practice among blog owners is to mention somewhere in the footer of the blog that ‘content should not be reproduced elsewhere without prior permission‘. This in itself is a form of blogging copyright or as we call it blog copyright laws. Blogging copyrights can be transferred to give the ownership to someone else. This requires a written agreement. Here is a typical example of a content transfer agreement. When a writer creates content for a blog that he does not own, the content still belongs to him unless the blog’s terms and conditions state that any content in the blog belongs to the owner (blog owner). The work-for-hire concept is an exception The above stated rule does not apply to people who work on being hired. Many bloggers work for agencies under the work-for-hire concept. In such case, all the content provided by the writer belongs to the agency. Freelance workers who are employed under the work-for-hire concept have to be aware of this and be cautious before signing agreements. What to do when your content is stolen? The copy-paste function of Windows is a boon but sometimes, it’s a burden as anyone can make use of any contents on the web. There is nothing more painful than seeing your hard-earned work being stolen away. Infringement is also a crime. So how do you punish the guilty? Drop in a mail and let the blogger remove your content. Make sure you express your displeasure in a polite manner. Often your problems may be solved here. Do this if the blogger does not respond to your email or claims that he has not violated copyrights. The Cease and Desist Order could be accompanied by copyright infringement notification along with a warning for more legal actions. Digital Millennium Copyright Act or DMCA is capable of removing a blog from the server, if found guilty of infringement. Hence filing a complaint to the DMCA will be the ultimate idea. You can also file a complaint to Google Adsense if the blogger has Adsense in his site. A lot of bloggers argue that they have provided more exposure to your post by putting them on their website. There are some that may even claim that you should not have published your post on the net if you wanted them (the content) to be private. Irrespective of what they say or mean, there is no way a creator’s art can be taken away without his permission. And on that point, the law stands by your side. That is how serious blogging copyrights, blog copyright laws and copyrights violation can be. Study them well before you take up blogging. So if you also copy blog contents (partly as well) then do credit it with a proper linkback somewhere in your blog post. Have you ever faced copyright charges or charged another blogger for copyright violation of your content through DMCA or other means ? Share your experience. Hi there, I read a lot of blogs and it seems to me like there is much copy paste going on. But how’s got the original content? people pay for content, sometimes the same content gets distributed to many sites by the writer. Try to come up with unique content is difficult, try writing a “how to” blog about e.g. changing break-pads. Brother i have same question as above two comentators have.i want to know how to get data for post and what about image using for other site.Kindly tell us.or give link if You have publish post about this question. Another excellent article, you have explained it very well. I got all my doubt cleared now. Thanks.